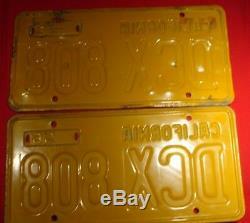 Up for sale are two vintage CONSECUTIVE sets of 1956 California License Plate pairs. This is a must-have for the person who has multiple vintage cars from this era - I think it's extremely rare to find two consecutive-numbered sets of ORIGINAL 1956 CA License Plate pairs together after 60+ years! These license plates have black letters/numbers with a yellow background. Please keep in mind I live in New Jersey and I have no way of doing this directly - Thank you! The back plate of this set has an off-white 1962 California sticker with green letters/numbers. The back plate (with sticker) is in pretty good shape. There are lines in the paint, which I think happened during the manufacturing process. The paint is rough to the right of the last "8" all the way over to the right edge. This also happens, to a lesser extent in the area above "California" and "56" to the top edge. The front plate of DCX 808 has a few issues: a It appears a previous owner pulled the plate off while it was still screwed on the car - The hole above "56" is ripped open and dented. B There's a crease in the metal above the letters and numbers - This crease starts above the "D" and goes all the way over to the right edge. C The metal is raised inside the "D" and "C" , along with being indented inside the lower part of the "X" and on the lower right side of the last "8". The right boundary is raised/indented in the area where it's missing its paint. D There black paint is scratched in various areas of the letters/numbers (see picture). The back plate of this set has a green 1959 California sticker with black letters/numbers. The paint on this plate is dull/weathered and has lines throughout the plate, which I suspect happened during the manufacturing process. There is light surface rust in between some of the letters in "California" and above. There is surface rust above the sticker and above "09" and "56". The surface between the "9"/ "56" and the right edge of plate is very coarse. The paint on the front plate of DCX 809 is dulled/weathered. The left boundary seems pretty smooth but it's very course on the other three boundaries. It is also very course on the lower right corner of the plate, to the right and below the lower part of the "9". COM (Notice 123) Rates effective January 21, 2018. Thank you very much for looking at my listing! The item "Two Consecutive Vintage Sets of 1956 California License Plate Pairs 1959/1962" is in sale since Friday, January 11, 2019. This item is in the category "Collectibles\Transportation\Automobilia\License Plates\US\ California". The seller is "thomasb0726" and is located in Voorhees, New Jersey. This item can be shipped to United States.